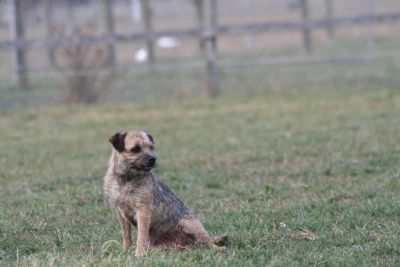 Indi is pictured above enjoying a fun day of Lure Coursing. Indi is a fun loving sweet natured girl who's main ambition in life is to please those around her. Indi is from our first litter and we could not have been happier with the results. Indi gained her title with ease at 13 months of age amoungst strong competition, Indi prefers to keep an eye on things at home and only comes out to shows occasionly. She is a Multi Class in group and class in show winner and at this years Border Terrier Champ show was awarded Best Headed. 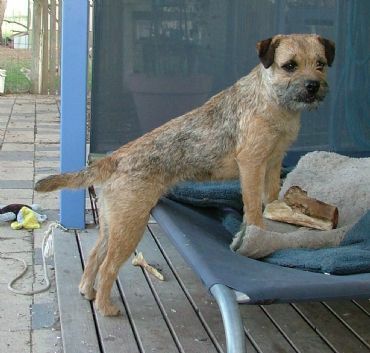 Indi has proven her worth in the whelping box, producing one of the up and coming youngsters - CH Glenbogle Dare to Dream aka "Soda" who at 8 months of age was awarded Best of Breed at the Scottish Breeds Champ show under Breed Specialist Miss Julie Clarke of Lester Borda Border Terriers in New Zealand at her 4th outing. Indi had two passes in Novice Earthdog one pass with Dr Claire Stainsby and one pass with Laurie Mackenzie and now has her Novice Earthdog title. Her daughter Soda (Ch Glenbogle Dare To Dream ) also obtained her Novice Earthdog title on the same day. Go Mother and Daughter. Now on to the next stage, getting their Senior Earthdog title, stay tuned in. 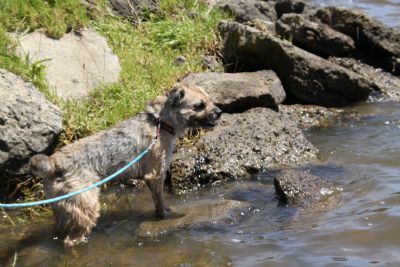 Indi just after having puppies 12 weeks ago, gains her Endurance Title at Lake Guthridge, Sale. Indi was in the hands of her handler Jodie Allan. Jodie and Indi did the 20 kms easy.